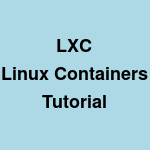 LXC (Linux Containers) is an operating-system-level virtualization environment for running multiple isolated Linux systems (containers) on a single Linux control host. Here is a quick start guide for getting started with lxc on Ubuntu Linux. $ sudo lxc-attach --name ubuntu-test -- python -c "print \"Hello\""